Other Common Names: West Coast hemlock, Pacific hemlock, British Columbia hemlock, hemlock–spruce, and western hemlock–fir. In doors, windows, staircases, louvered cabinets, mouldings, spindles and paneling, hemlock has a reputation for excellence in form and function. The kiln or air-dried wood is very stable with little tendency to cup, check or twist.. It yields clean straight edges and accurate contours to either machine or hand tools. This combination of stability and smoothness has also made Hemlock a favorite wood for the construction of saunas. The overall uniformity of coloring from heartwood to sapwood, from light honey to a rich golden tan, and the wood's excellent gluing properties make it ideally suited to finger jointing, edge veneering and laminating. Whether used extensively or in small decorative elements., Hemlock complements virtually any architectural style or design scheme. The heartwood and sapwood of western hemlock are almost white with a purplish tinge. The sapwood, which is sometimes lighter in color, is generally not more than 1 inch thick. The wood often contains small, sound, black knots that are usually tight and stay in place. Dark streaks are often found in the lumber; these are caused by hemlock bark maggots and generally do not reduce strength. Western hemlock is moderately light in weight and moderate in strength. It is moderate in its hardness, stiffness, and shock resistance. It has moderately large shrinkage, about the same as Douglas-fir. Green hemlock lumber contains considerably more water than Douglas-fir, and requires longer kiln drying time. Trees may contain wet wood and/or have ring shake. The wood is intermediate in nail holding ability and has a tendency to split when nailed. It is satisfactory with respect to being glued and in taking stains, polish, varnish and paint. it is priced for door, window, staircase and trim manufacturing. Architectural milling is also one of the main uses. It grows along the Pacific coast of Oregon and Washington and in the northern Rocky Mountains north to Canada and Alaska. Appearance is almost identical to amabilis fir. It has a fine straight grain with little difference between heartwood and sapwood, which is uniform in color, ranging from creamy white to light gold. Photo: above left: This entry table is made out of Hemlock. « Hemlock Interior Paneling Manufactured for either tongue-and-groove or lapped applications. From these two basic types , we develop a number of paneling profiles by varying the surface design to complement any style or period of architecture or interior design. « Hemlock Clear Vertical Grain is the main grade we offer in a variety of applications. Call us and find out more about this rare specie. Clear Vertical Grain - This is the top quality grade available. Lower Grades are available in large quantities of 1,000 Board Feet or more. Tongue & Groove , Channel , Pattern 105 , Edge & Center Bead , S4S. 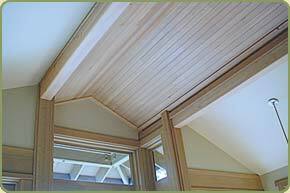 Above: Hemlock custom ceiling paneling. We can mill Hemlock to virtually any pattern of your choice. Durability: Good service in construction, although it has little resistance to decay. Finishing: Somewhat resistant to conventional preservative treatment. It can be pressure treated but is more effectively treated by a water diffusion process. Stability: It has moderately large shrinkage, about the same as Douglas-fir. Workability: Easy to work in all hand and machine operations and has little dulling effect on cutting edges.